The moment has finally arrived. 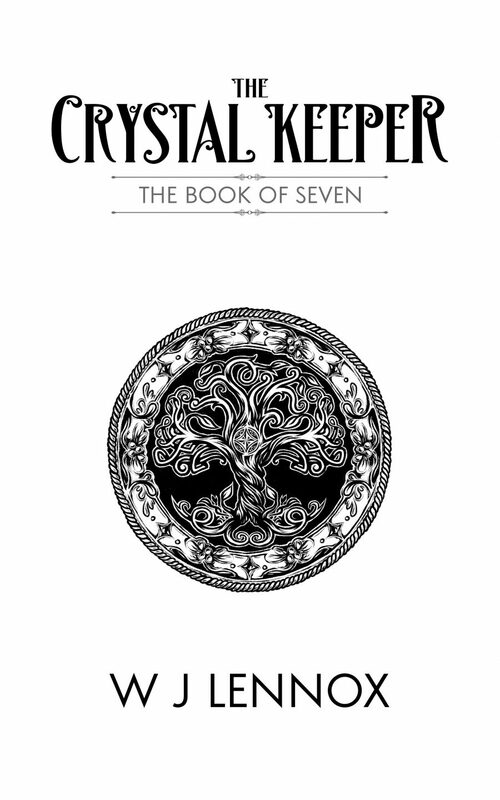 I’m thrilled to unveil the cover and title of the second book in The Crystal Keeper trilogy – The Book of Seven. I hope you like it as much as I do. 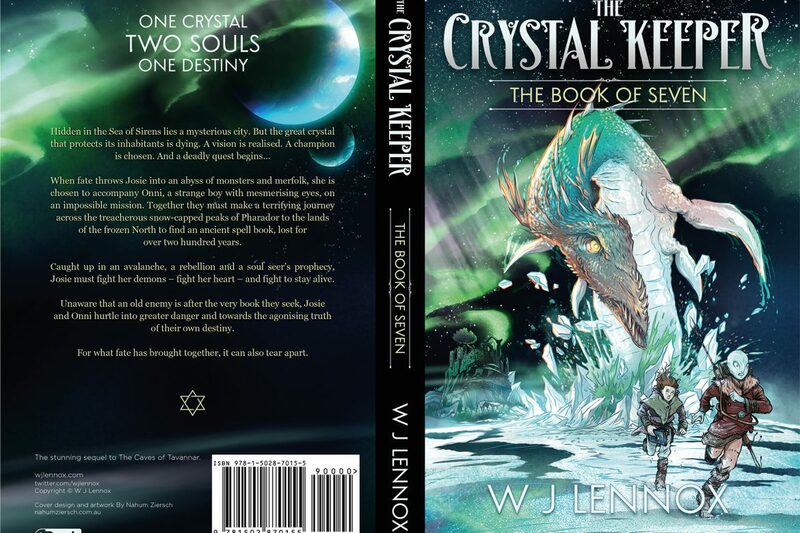 When fate throws Josie into an abyss of monsters and merfolk, she is chosen to accompany Onni, a telepathic boy with mesmerising eyes, on an impossible mission. Together they must make a terrifying journey across the treacherous snow-capped peaks of Pharador to the lands of the frozen North, to find an ancient spell book, lost for over two hundred years. Caught up in an avalanche, a rebellion and a soul seer’s prophecy, Josie must fight her demons – fight her heart – and fight to stay alive. Unaware that an old enemy is after the very book they seek, Josie and Onni hurtle into greater danger and towards the agonising truth of their own destiny. For what fate has brought together, it can also tear apart. In this stunning sequel to The Caves of Tavannar, Josie’s return to Galidom is a far cry from the joyful reunion she’d hoped for. While friends fight for their lives in the south, Josie must face a battle of her own, as the pendant takes her north on a perilous quest to save the ocean city of Nysa. From the depths of the Sea of Sirens to the glacial mountains of Pharador and beyond, Josie’s courage and endurance will be tested to the limit in her struggle to find an elusive spell book. Filled with impossible choices, ill-fated love and shocking secrets, The Book of Seven will draw Josie deeper into an age-old conflict that will have far-reaching consequences not just for herself, but for everyone she loves. As the scars of an ancient war re-open across the twelve kingdoms of Galidom, friends old and new will be forced to fight for their homeland and their freedom. If you love fantasy adventures filled with epic battles, heroic warriors, monstrous creatures, breathtaking landscapes, ancient prophecies and dark sorcery, The Book of Seven is for you. The story is steeped in Celtic, Nordic and other world mythologies, with many spiritual and paranormal themes woven throughout. 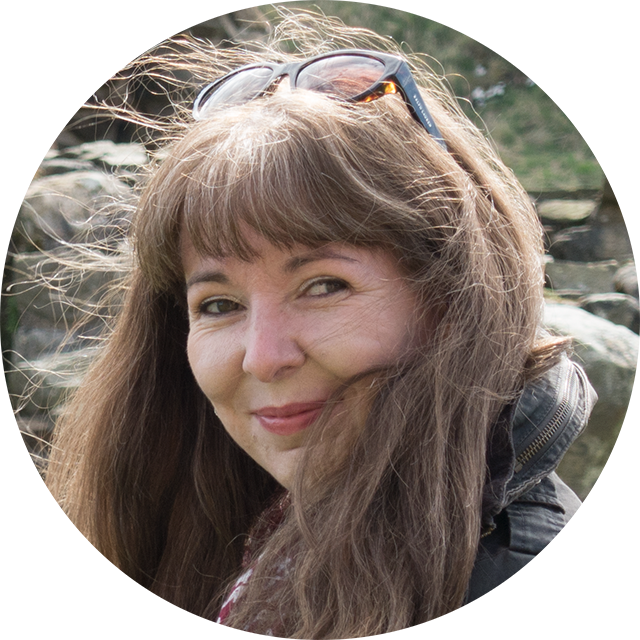 There is magic and mystery, love and loss, hope and betrayal – and some surprising twists along the way. 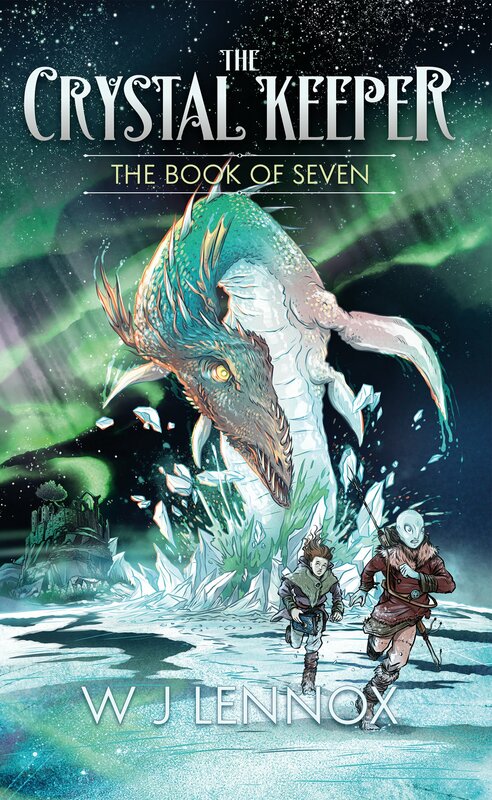 The front cover portrays a particular scene from The Book of Seven, where Josie and Onni are fleeing across a frozen lake after waking the terrifying Fyrinn from its winter sleep. The illustration was in part, created from my vivid imagination, but I also drew much inspiration from the many spectacular and hostile landscapes found across our own incredible planet. I’m lucky enough to live in Scotland where there’s no shortage of historical landmarks, beautiful abbeys, churches and formidable castles. It should therefore come as no surprise that the rocky island crag that Eirondal Castle sits upon in my story (which you can just make out in the background of the cover) took some of its influence from the iconic rock of Edinburgh Castle. Ironically, Eirondal’s circular curtain wall, round gate towers and great keep doesn’t follow the typical design of a Scottish Castle, and instead is more in keeping with an Anglo-Norman Motte and Bailey castle. I was greatly inspired by Lindisfarne Castle in Northumberland, Restormel and St Michael’s Mount in Cornwall, York and Windsor Castle. One of the most striking elements of the illustration (apart from the lake monster :D) is the ribbon of dancing light streaking across the night sky. For those of you who follow me on Pinterest, you can see from my numerous pins how much I love the Northern Lights and the stunning landscapes of Norway, Sweden and Iceland. I hope to get the chance to fulfill my life long wish to visit this incredible part of the world one of these days, but in the meantime, I’ve tried to capture some of that Nordic magic between the pages of my story. If you’re wondering what all the fuss is about, take a look a this video clip and you’ll understand why the aurora makes my soul sing. I haven’t posted the back cover illustration of the paperback edition, but trust me it’s as magical as the front. I promise to put up a pic of the whole cover when the hard copy is available to purchase.